Miss "Lady", what are you made of? Sugar and spice... a little naughty and maybe a few spikes? At first sight, you're straight-laced, classy and a bit conservative. We all know there's more to you than that. You've got a little edge and it shows, especially in these ankle strap patent peep toe pumps from Le Silla. The gray hue, peep toe and ankle strap hint at highbrow style, but the double row of pyramid studs on the heel say there's a little nonconformist in you yet. As I'm sure you know, it's Fashion Week in New York. Whether you're in the Big Apple or not, toast the occasion with a "Lady of the Evening" (image courtesy of Imperia). It's served at the Bryant Park Hotel's Cellar Bar for $25, but you may be able to score one at your area's swankiest spot. 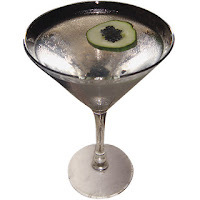 Just let the bartender know it's a standard martini made with Imperia Vodka and a cucumber and caviar float. Them shoes are hot!!!!!!!!!!!!!!!!!!!!!!!!! And the drink looks cute too LOL.